Clutter. For most parents it’s an everyday challenge, but not one the time-poor can meet very well on a daily basis. Parent or not, if you’re overwhelmed by an excess of stuff in your home, it can have a negative impact on your wellbeing. Research has proven the link between the clarity of a person’s mental state and the amount of visual clutter in their home. Case studies have shown that clutter leads to poor time management because it causes distraction and hinders us from finding what we need quickly, and in many cases is associated with depression and stress due to the overstimulating effect it has and the anxiety we create about dealing with it. For me, being a mother and contending with clutter just seems to go hand-in-hand. Clutter in the home can make already very busy parents feel overwhelmed and frustrated and, let’s be honest, tripping over toys and kids’ furniture can be the little thing that pushes you over the edge. As a professional home styler, however, I know that a clean and organised living space is key to maintaining a positive state of mind and promoting positive emotional health for the entire family. The good news is that clutter control is 100% achievable. 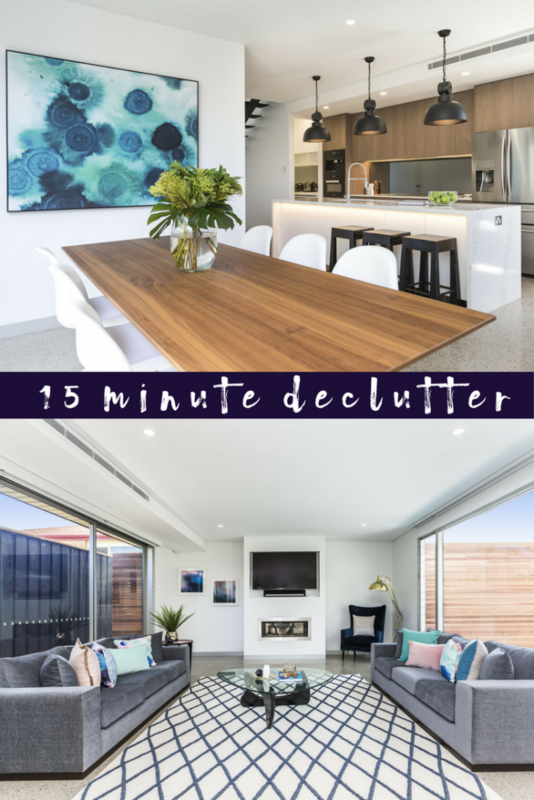 After reading this, go through the decluttering plan and then set aside 15 minutes—just 15 minutes!—to do the Declutter Dash. Who is going to do it? Identify your team. If you can’t find any volunteers, that’s not unusual—fortunately this is a job you can tackle on your own if you have to. What resources will you need? Bin bags and storage boxes could be helpful. Use a kitchen timer or an alarm to time the 15 minutes. Which rooms will take priority? Identify the rooms that are irking you the most, then outline the key components in each room that need to be addressed. When can you do this? Set a target date for each of the tasks to be completed. I recommend breaking it up into small chunks throughout the day or the weekend as setting aside a whole weekend for this process can be overwhelming and physically draining. Below are the rules of a Declutter Dash: they have been designed to be realistic, manageable and most of all, satisfying. The Dash takes no longer than 15 minutes. You may not tackle a whole room. Select only one component of a room and do it thoroughly rather than addressing a bigger space that cannot be done in 15 minutes. Once you pick up an item, you may not put it down. Make an instant decision about what to do with it—it must be sorted accordingly. Once you have made your decision, you cannot change your mind, you must go onto the next thing. Reward yourself at the end of each Dash. Have a cup of tea, watch an episode of your favourite show or read a chapter of a book. You’ve earned it! When you have finished one Dash, repeat for every room and challenge yourself to decrease the number of items you choose to keep second time round. One way to sustain clutter control is to take ‘before’ and ‘after’ photos to remind yourself not to undo the hard work you have just put in. When you finally have your headspace back, you can then work on developing new long-term habits and systems to keep your home clutter-free, prevention rather than always using the Declutter Dash to fix the problem. What’s your most effective rule of decluttering? Share your thoughts and experiences with us below! Want to get some help with the first steps to de-cluttering, check out our 20ways in 20days to a clutter free challenge which will be starting again soon.